Well, after transfer to the keg, and about 1 week of conditioning under pressure, I drew a sample to try. The recipe for the beer is here. This beer ended at 1.012, with an ABV of 4.95%. This is quite a high final gravity for this strain, and likely due to the lower temperature at which it was fermented. There was also more crystal malt in this beer then the other saisons, so this beer should have more unfermentable sugars in it. Again, the malt bill was more in keeping with Bier de Garde, so in color and final gravity, I think we are there. On to the tasting! 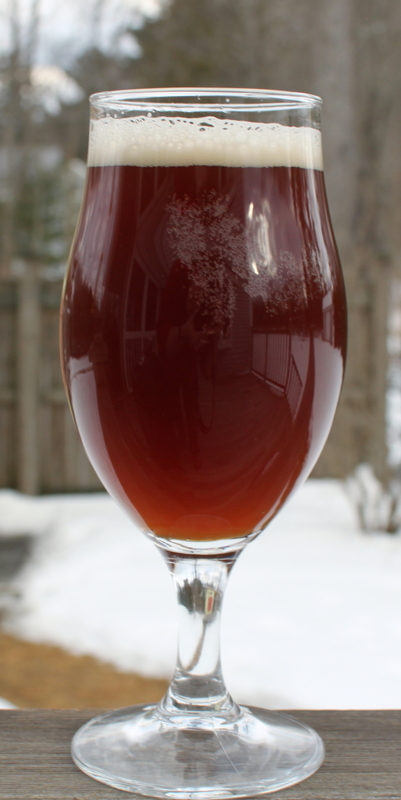 Color — cloudy, reddish brown beer. Aroma — Lots of spiciness, cloves, some pepper. There is also a herbal and woody/earthy note which I think is also the yeast. You can smell some of the dark caramel and tobacco in the background. Taste — Thinner body, I get some caramel up front, with a slight astringent dryness I taste I think from the chocolate malt. There are some fruit esters, but more of the banana flavor then any dark fruits. It finishes with a nice balanced bitterness, with just a touch of caramel sweetness. There is a bit of a bite at the end, which I usually associate with wheat in beers, not sure if this is the buckwheat. Critique — The first thing that jumps out at me is the yeast. Even at 73F, 2 degrees below the bottom end of the recommended range of the yeast, you still get a very strong and distinct flavor profile. The yeast is the dominant flavor, and without more hops for it to play off, it kinds of overpowers everything else. As it warms up, I get more maltiness in the taste, but I don’t care for it as much as I did in the hoppier saison I made. I like the maltiness, but it kind of gets lost in the yeast driven flavors, and I think I would add more aroma hops if I was to do this again. Still, it goes down pretty easy, so we will see how this evolves over the weeks to come. As far as the buckwheat, with the recipe, it is hard for me to say exactly what it brings to the beer. It is quite cloudy, so I suspect that is partially the buckwheat. I do get a bit of a bite at the end that I associate with wheat, which maybe the buckwheat, or it could be the yeast. In the future, I will likely just use wheat flakes in the mash, as they are just easier to use. I enjoy this beer, but there is room for improvement. I think the take home is that this yeast strain should be really paired with fruity, hop focused beers, and downplay the malt characteristics. Malt expression just is not a strength of this yeast, and it is such a distinct taste, you can’t tame it very well, so I guess I should just embrace it and play up to it. Now, pair this recipe with an English ale yeast, and I think you got a nice Northern Brown on your hands.